All posts tagged with "teamwork"
Wow, it’s been a long time since we’ve posted anything on the blog. Sorry about that guys. The big patch beta has started, those of you who are interested in trying it out can take a look here. There are still a few bugs in it, but we can use all the help we can get in testing it out. Windows only for now, OSX and Linux on the way. We have sent 1.0.9 off to our friends at Steam, but they are really busy right now. As far as we are aware, the Mac version has been successfully delivered to the distribution servers, so those of you with the Mac problems we were experiencing should be able to get your fix. As far as the Windows flavor of Dredmor 1.0.9: we sent them an extra copy just in case they left the first one in their pants pocket at home, so we are expecting it to be up sometime today. I will edit this post when we have confirmation of it being available for download/update for everyone. Thanks for your patience, we will get to the bottom of it. UPDATE: Looks like Steam is slowly rolling out the 1.0.9 update. In order to get it to update quickly it is possible to delete the local files and reinstall, but those more patient than I should have it shortly (this will not erase the save files as they are stored elsewhere). UPDATE 2: Some users are reporting issues with existing characters experiencing a teleportation bug. We’re working on it right now; if you do have this problem, just force-quit the game (ctrl-alt-del) and roll a new character while you wait; it seems to only affect existing characters. We will keep you up to date as we get more info. Realm of the Diggle Gods will be released for sale very soon. Indeed, sooner than you imagine, unless you’re a very imaginative person indeed. A big thanks to the talented Ian aka Verbal Processing for creating this trailer for us. Check out his Youtube channel in which he plays and discusses various games in an amusing manner. You’ll laugh and maybe even learn a thing or two. And credit as always is due to the talented Mr. Steele who created the music; you can listen to as well as purchase the Dredmor soundtrack at Matthew’s bandcamp site. If you don’t abide by Your Tubes, please do enjoy these screenshots that follow featuring all sorts of new nonsense you’ll discover in the Realm of the Diggle Gods. Here, in the (new) Underground Forest, I make use of the lovely new fireball effect while a pack of loyal hunting diggles looks on. It’s possible some were caught in the blast. They’re very loyal. Usually. EDIT: Okay, final patch release date for 1.0.4 can now be confirmed as Tuesday morning – the morning of September 6th, 2011. We’re putting one last beta out even as I speak, and the actual release candidate will be sent to Valve over the weekend. Why are we doing this? Well, frankly, because it’s a very bad idea to ever release a patch on a Friday. That’s just asking for something to go wrong and for everybody to be frustrated over the long weekend. So go enjoy your last few moments with Dredmor 1.0.3, and throw some Lutefisk on the grill. Next week, there’s a whole new Dredmor waiting for you. — N.
We’ve been fairly quiet on the blog so I figured I should fill everyone in on progress on various fronts. Let’s dive in. We released the second iteration of the 104 to testers yesterday and it seems pretty stable. Lots and lots of small fixes, tweaks, and rebalancing plus a few new features (like the “digest” button), some new content, and some new achievements (pictured above). There are also known smaller issues, tweaks, fixes, and new content that aren’t going into the 1.0.4 patch because we want to ship a patch sooner rather than never. We’ll push them to the next patch. Your patience in all of this is very much appreciated; we’re a tiny team. We’ll try to assemble a comprehensive list of changes when the actual patch ships — this may be as soon as Friday, if all goes well. Nicholas is moved to Vancouver and he and I are now set up in a shared office space – naturally, with a coffee machine running at all time. Expect crazy things. We’ll have to post a picture as soon as we remember to do so and aren’t all busy with this patch. We’ve also got income coming in now so we can focus our efforts on Gaslamp (read as: Nicholas doesn’t have to sell his belongings to make rent). Is a real thing that really exists and it’s up next on the to-do after patch 104 ships. Deals have been made and will be announced when the time is right. Is also a thing that will happen after patch 104 (and of course requires the above non-Steam distribution channels because there’s no Linux Steam … yet? Looks like it’ll be UI upgrades, some fun content, the usual round of fixes and rebalancing, and official/useful modding support seems likely. We’re aiming to fire off a patch every two weeks and I hope we get the process smooth enough to be able to do so. At the very least there won’t be delays like that between 103 and 104 (as that was due to a move and sorting out how we can actually pay ourselves). The future of the Dungeons of Dredmor looks bright. Or dark and murky, if that’s what a dungeon is supposed to be. Whatever – point is that we’re getting on track with running a business and working out how to systematically patch (and work on Project Odin) in an organized manner without random stuff exploding. One step at a time. If there’s anything else y’all would like to know feel free to ask in the comments and I’ll answer if I can. It looks like much of the crashing is quashed (and that’s all up to Nicholas’ code-magic anyway) so I figured I’d waste time drawing a silly picture of a bunch of the folk who made Dungeons of Dredmor possible. Nicholas: he is the master of code and creator of the original Dredmor project back in, what, 2005? He can be awfully English at times. David: (that’s me! ), art, content, and other silly stuff. Daniel: handled much of the earlier gameplay code then became a rocket scientist or something and is doing a lot of the internal business operations and PR. The lutefisk thing is probably his fault. Derek: Server-keeper, web guy; We panic and leave him voicemail when our servers crash and burn. Chris: A driving force of Business Acumen, he gets the deals done. Matthew: Sound and music guy. Maestro? Does that work? And did I mention you can listen to and/or buy the Dredmor soundtrack from him? Now you know who to blame. We’ll get back to our scheduled Dredmor Bloggageddon featuring Actual Content Of Substance And Import once the release-week madness calms down a bit. Hope you’re all having fun! If you’re not, please fill our contact email inbox with the reasons why plus crash .dmp files and broken savegames. 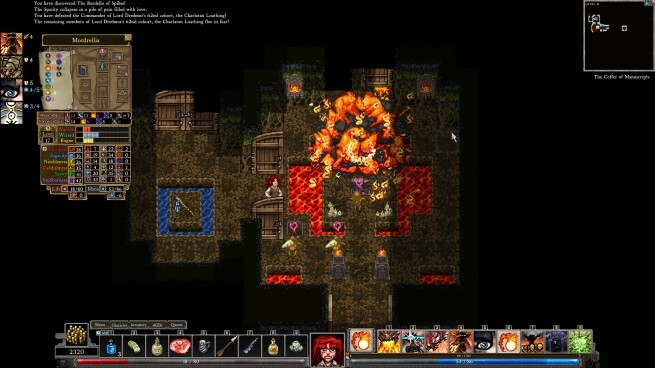 From Gamer Credentials : Dungeons of Dredmor Preview – suddenly diggles, thousands of them! It’s hard to believe, but just about a week ago Daynab (a Dredmor beta tester) wrote up this quick preview of Dungeons of Dredmor. All I’ll say is that he’s been a big help and Dredmor has come a huge distance in this short time. And how about a word on Beta and Crunch? Yes, this is the post on stairs alluded to by Nicholas a few days ago! And it is actually just about stairs. 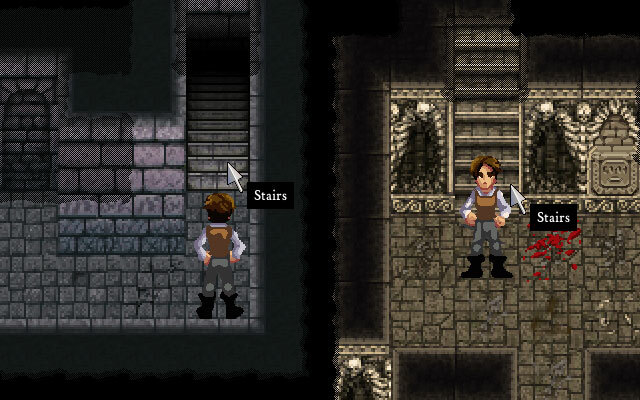 … But it might well tell a story which informs all manner of gameplay design processes carried through the development of Dungeons of Dredmor. They’re lovingly cut into the dungeon walls and use of the stairs is implicit in walking onto them. Simple enough. It was not always so. Nicholas: although I suppose if the player gets oiled, that is a possibility as well.